Nestled in the province of Southwest Holland with a population of 70,000 people, sits the charming little town of Gouda. You may know Gouda as a cheese found in your local supermarket where you are from and rightfully so, as it is one of the most popular cheeses on the market. While staying in The Netherlands, I wanted to explore this lesser known gem of a town that shares its name with its famous delicious cheese. Gouda is a town that exudes more charm and history than I had originally anticipated, so I was more than happy wandering the silent and historic streets that date back before the 16th century. 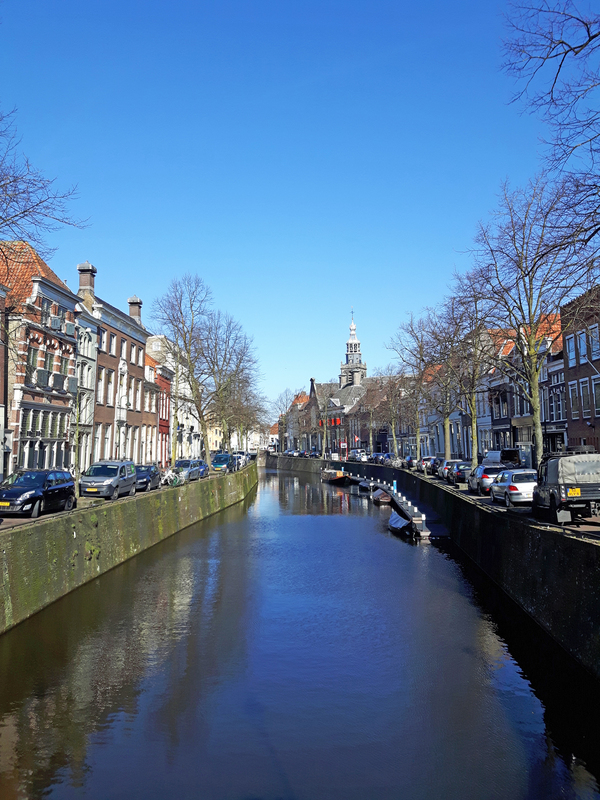 With small canals running throughout the town and a beautiful town square surrounded with shops and restaurants, Gouda made for a perfectly quiet and quaint day trip on a sleepy Monday morning. If you ever find yourself travelling through The Netherlands, I really suggest popping into Gouda for a few hours to relish in that “small town” charm. Now, without further adieu, I give you a quick city guide to Gouda. 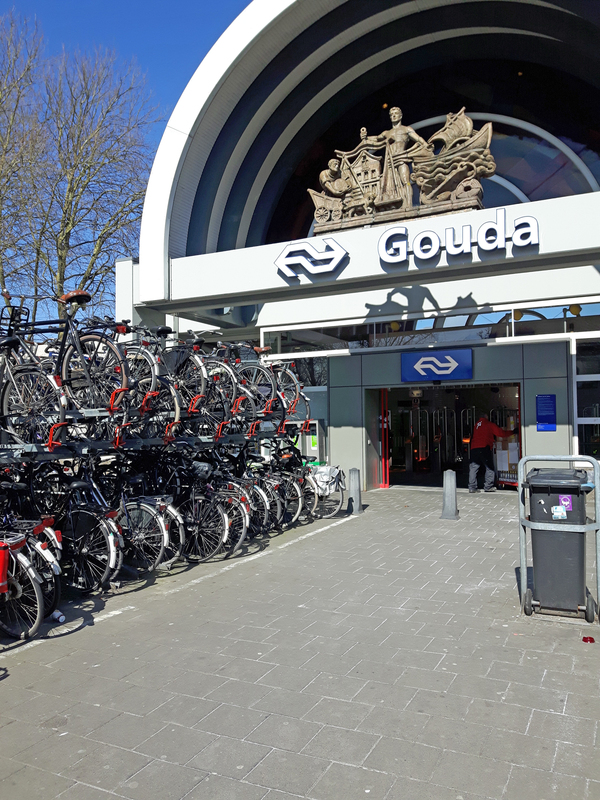 Travelling to Gouda via the Dutch Railway is fast and easily reached by train from Amsterdam Centraal Station, so it makes for an great day trip, or a relaxed and quiet little weekend getaway. I took the train from Utrecht as a day trip, which took around 20 minutes one way. 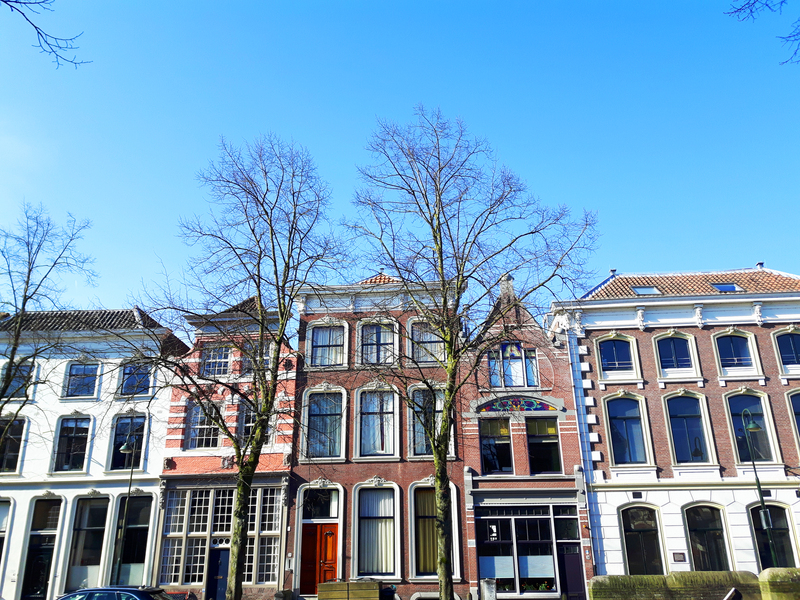 Once you arrive in Gouda, you’ll find that it’s very easy to get around on foot and see all the main attractions, which are mainly situated within the Old Town just a short ten minute walk away. For all train fares and schedules, visit the Dutch Railway website for more info. Although Gouda is smaller than most cities visited by tourists, don’t let its size fool you. This city is teeming with loads of history and beautiful buildings and canals that will have you happily wandering the narrow streets without a care in the world. 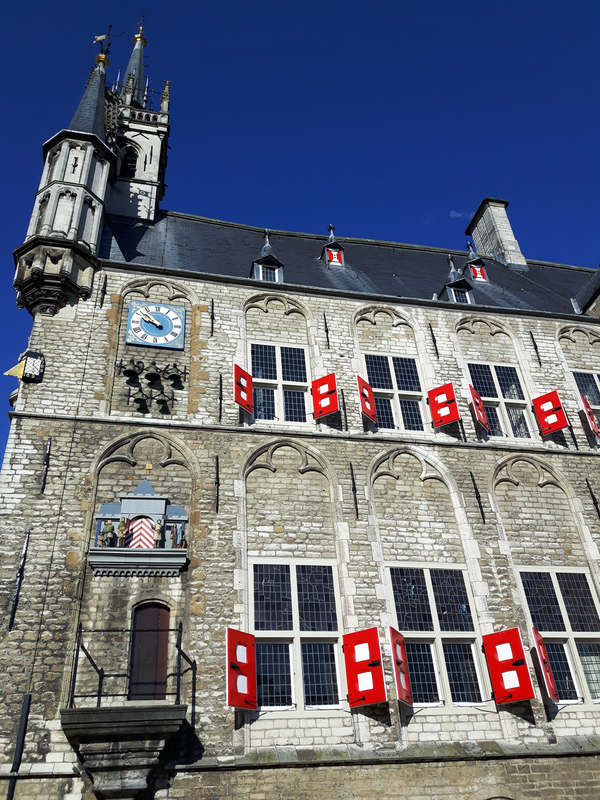 When I arrived to the centre of Gouda from the main train station and saw the beautiful castle-like Gothic town hall dominating the city centre, I definitely felt some fairy tale vibes, especially when the clock struck the hour and it played a song for an entire minute. It was very early, so I had the place all to myself and was treated to my own private concert. The details of the Stadhuis (Town Hall) are absolutely stunning. 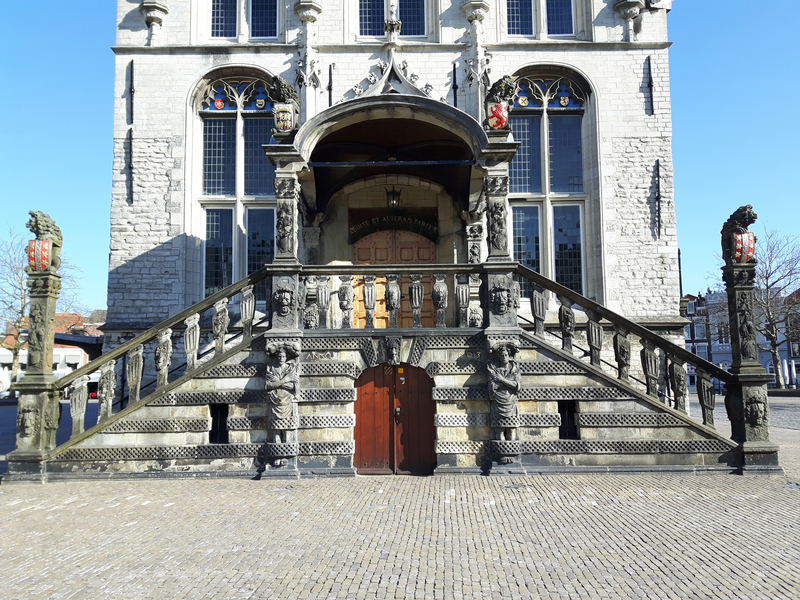 Constructed in 1448, it’s one of the oldest town halls in The Netherlands, so make sure to take some time to walk around it to admire and appreciate the attention to detail within its architecture. At the Town Hall, traditionally after a court case, if you were found guilty, you would have to leave the building via the left staircase and walk the length of the building to the back end. And if you were innocent? Well, you’d use the right staircase. To this day, wedding couples are still advised to use the right staircase to ensure good luck. 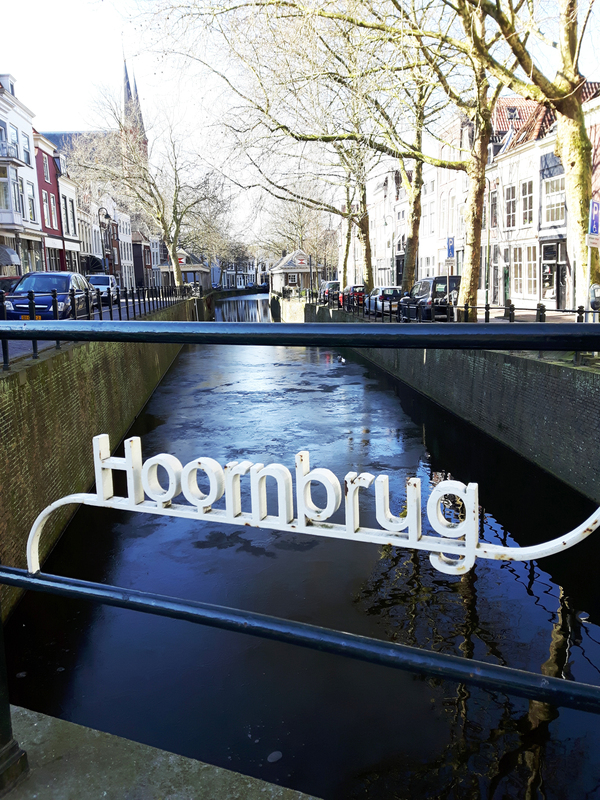 While walking through the city, you’re more than likely going to come across the Hoornbrug, or the “Horn Bridge.” This bridge was once made of wood during the beginning of the 16th century and then made out of stone in 1530. It was then completely renovated back in 1870 and finally in 1955, it was completed into the bridge walked on today. Who knew such a small bridge had so much history! When one is in Gouda, one must visit an authentic cheese shop to buy Gouda cheese. The best place to honour your cheesy cravings? 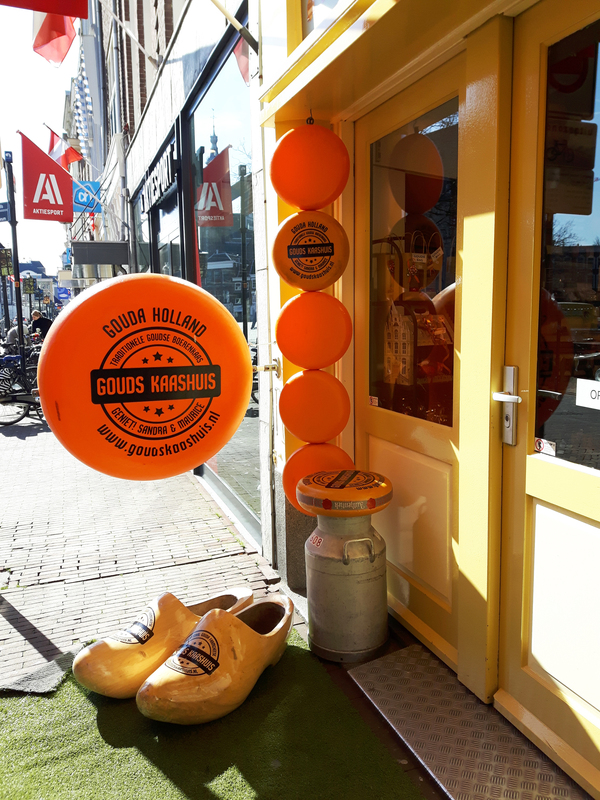 Head to the town square and hit up Gouds Kaashuis Cheese Shop. 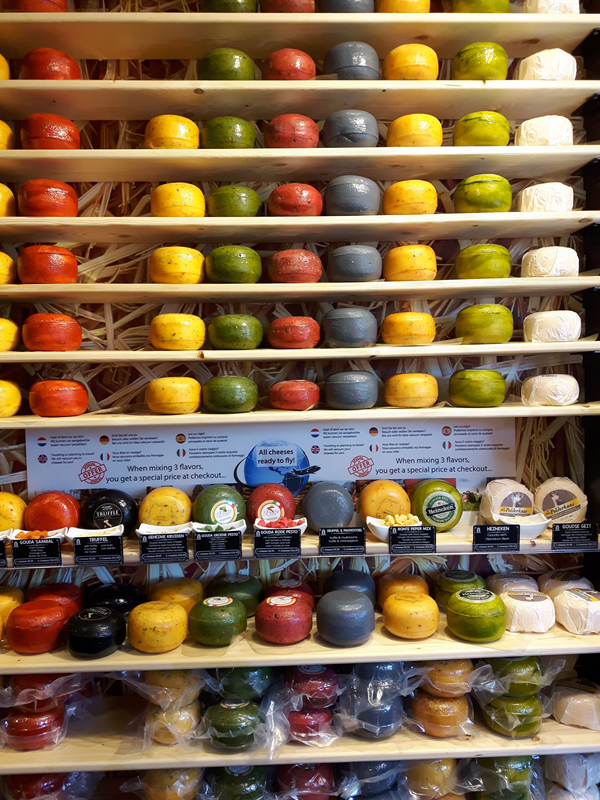 With a wall resembling a rainbow that’s full of vibrant colours, there are many different flavours, ages and sizes of cheese to choose from. This particular shop is run by the farmers that own the cows, that they get the milk from to make the cheese. The farmers and owners are even present within the store to help you choose a cheese you’ll love. With so many choices…how do you choose a cheese? Well, luckily for you, each cheese has a dish complete with cut up samples for the customers to try. I tried a five year old aged Gouda, which I bought and brought home because it was sooo good AND I even tried a lavender flavoured cheese, which was bright blue and you know what? It wasn’t all that bad! 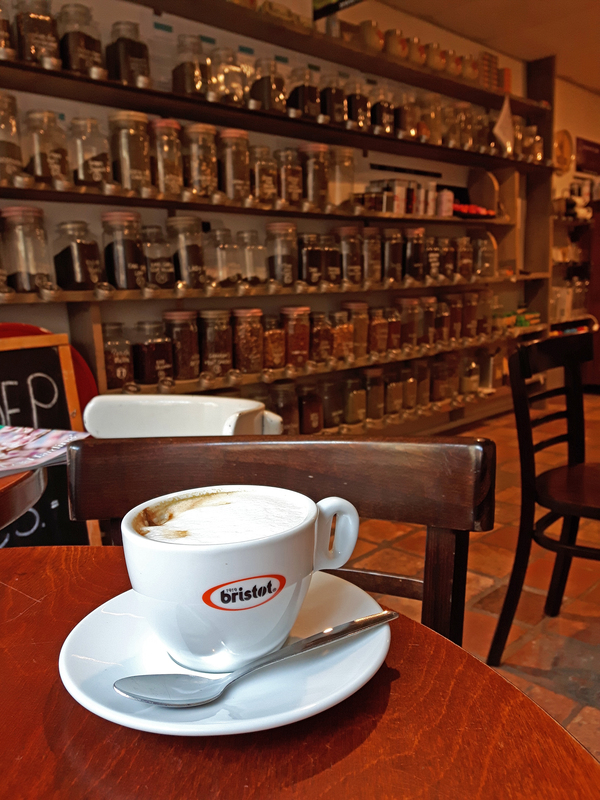 I then stopped in for a cappuccino at a teeny tiny coffee and tea house where I spoke to the owner about how a local chocolate shop infuses their chocolates with his teas to make for unique and tasty flavours. Hearing about how two small local business help each other out is what I loved. They focus on community over competition, which in this day and age, is very hard to come by. Gives you all the warm and fuzzy feels, doesn’t it? 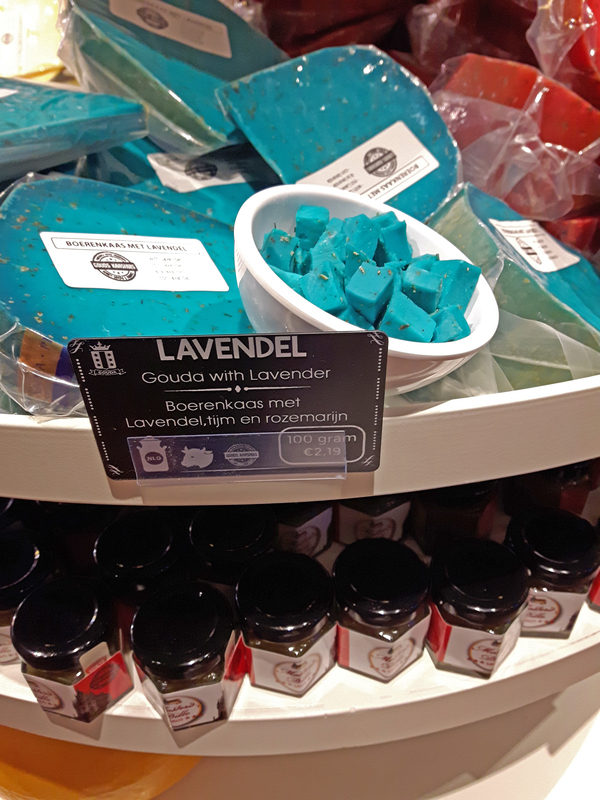 Gouda may be a small town, but that doesn’t mean you won’t be without many choices to indulge. With a town square mainly surrounded by restaurants with covered patios and views of the Stadhuis, it’s the perfect place to chill out and enjoy the slow paced life of Gouda. The small town streets are also filled with cute cafés and mom and pop shops that you must definitely visit as well. 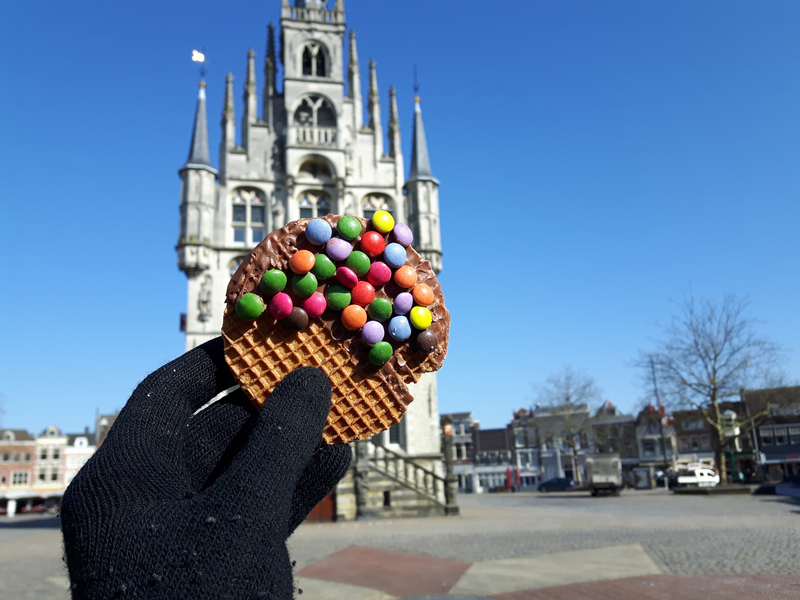 I’ve listed some of my favourites below, so be sure to look out for them if you’re ever in Gouda. 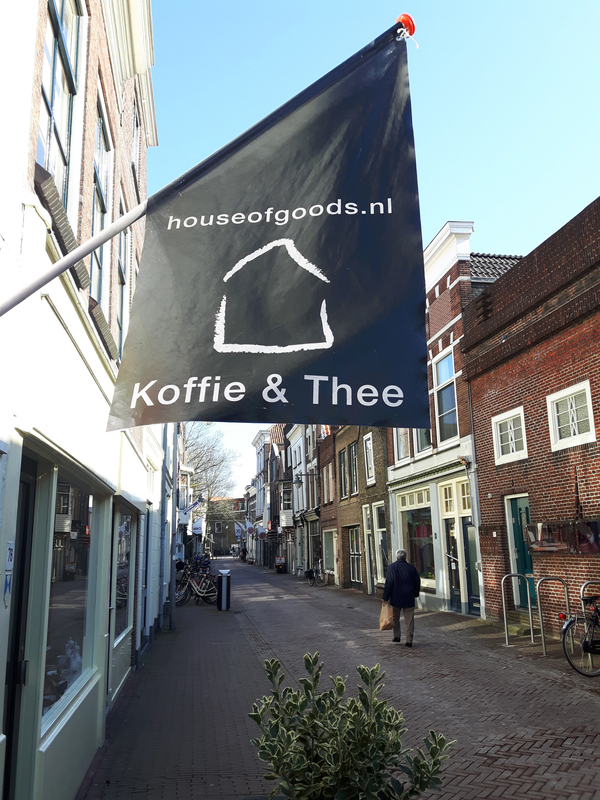 Caffeine Fix – If you’re wandering around Gouda and are looking for a place to grab a steaming cup of tea, or a coffee, then look no further than the House of Goods located at Lange Groenendaal 80. 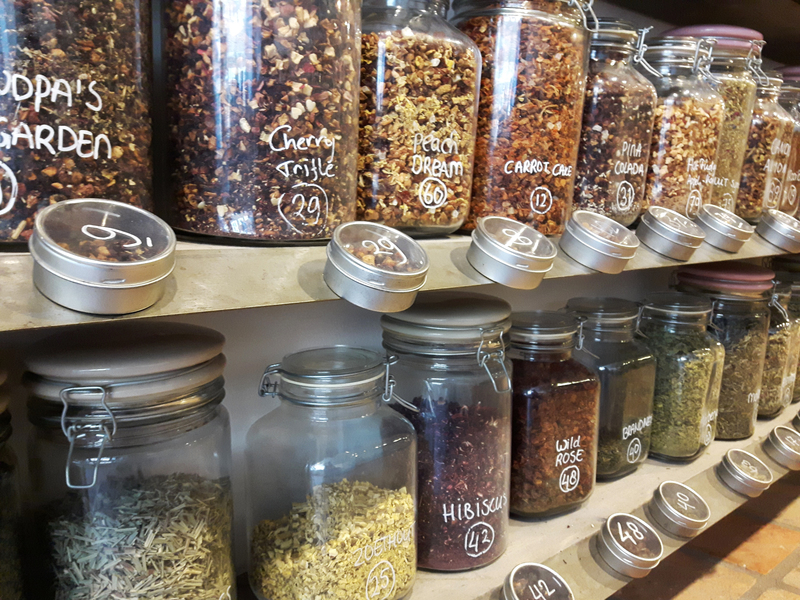 As soon as you walk in, you’ll feel as if you’ve walked into someone’s cozy home and be greeted by the friendliest staff who definitely know a thing or two about tea and coffee. With a wide range of selection to try, as well as take home, it’s the perfect place to duck into during those cold Dutch days. Craving Something Sweet – If you have a sweet tooth and are craving something sugary, head on over to Siroopwafels & Banketbakkerij-Tearoom Van den Berg at Lange Groenendaal 32. As soon as you walk through the door, you’ll see a wide range of Dutch souvenirs, tasty treats such as cakes, stroopwafels and other sweet treats. There is also a restaurant tucked in the back where you can order up a sandwich, sit down and enjoy. 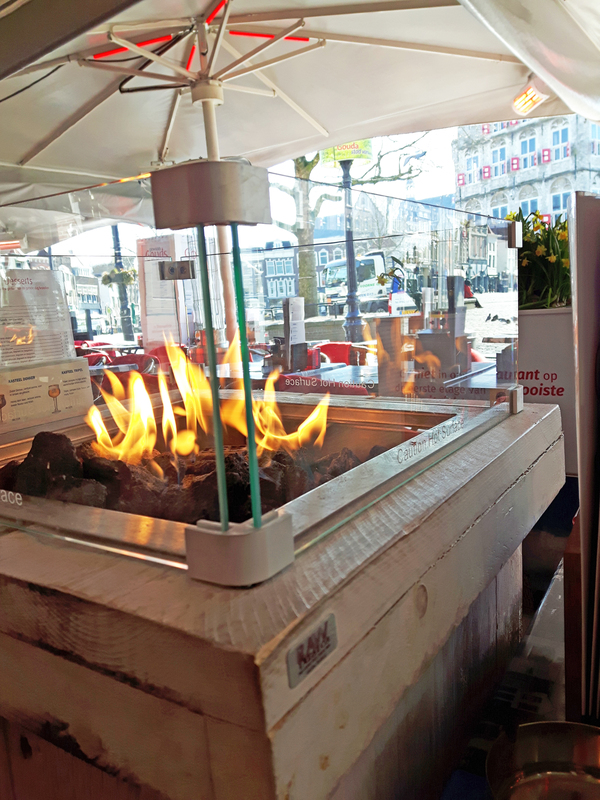 Patio with a View – For a cozy lunch, a place that caught my eye was Restaurant Gewoon Gouds located right in the Town Square. 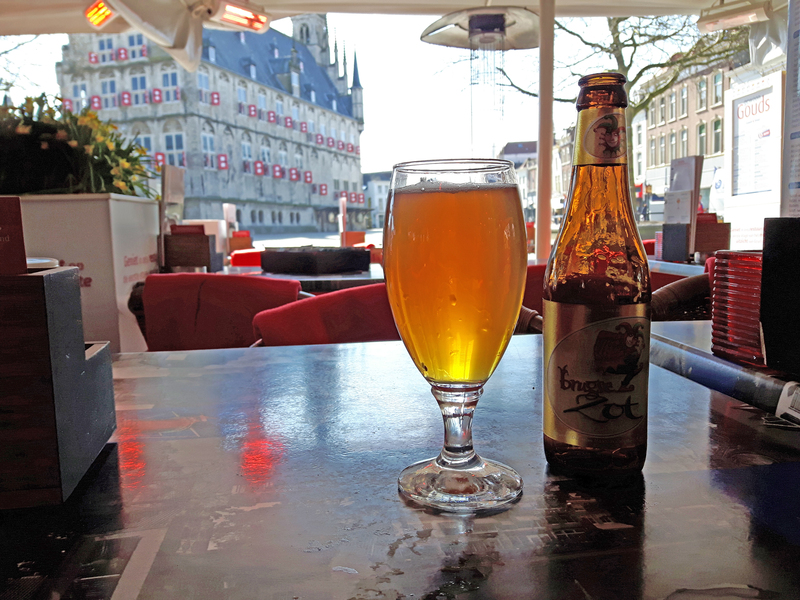 It was cold outside, so I was instantly drawn to their covered patio complete with cozy heat lamps, blankets and a beautiful view of the Stadhuis. The food and beer was fantastic and the waiters and waitresses were some of the nicest I’ve encountered during my travels through The Netherlands. Make sure to order the tomato soup, you won’t be disappointed. 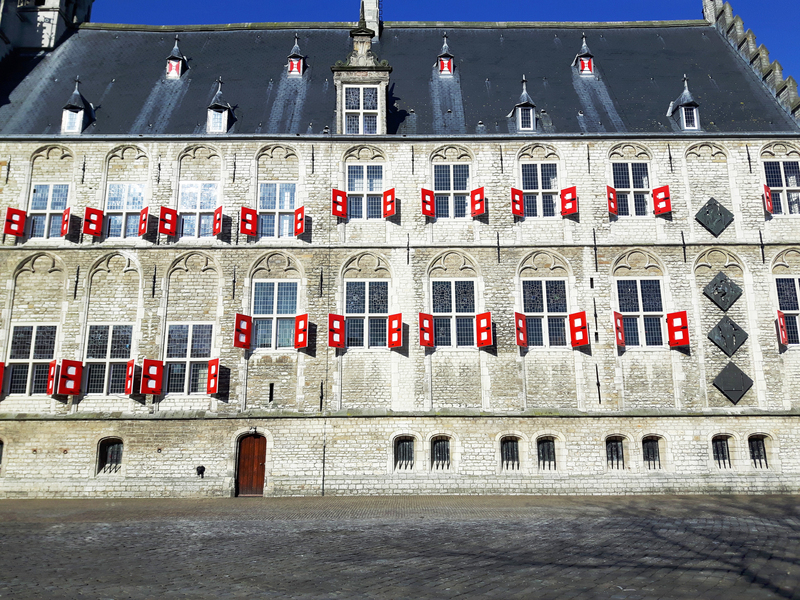 Definitely a must visit while in Gouda! Travelling to the smaller cities within The Netherlands, such as Gouda, was one of the more rewarding visits to me. I had the chance to visit the mom and pop shops and talk to the owners that make their businesses what they are to this day. These people had large smiles on their faces as they spoke to me passionately about what they do and to me, that was the best feeling; seeing local people and businesses thrive. I had no idea that this is where Gouda cheese came from. I always just assumed it was French, like so many other cheese we eat! Awesome- and I want to see that Horn Bridge in person! You definitely should go!! AND to top it off, us North Americans pronounce Gouda incorrectly. It’s actually pronounced “How-Da”. Crazy, right!!? LOL! OK, I definitely did not know that!